Research center, artillery, click: http://relicman.com/artillery/Artillery0000-Index.html. This is the "Ridgeway Civil War Research Center...", a research tool for educational purposes only, and is provided at no cost to the reader. Some of the relics listed are retained in the author's collection, most reside in other collections and are not owned by the author. None of the items listed in this section are for sale, please refer to relicman.com sales listings for items offered for sale. This is a work in progress, I list items as I get to them, there are many patterns that are not listed yet, this list will be regularly updated as I get pictures and descriptions for more items. I will also correct mistakes, so if you see any please tell me. All items listed are believed to be authentic to the Civil War or as otherwise described. This information is available for research purposes, pictures may be used by permission only. All excavated artifacts have been recovered from private property with owner's permission. All projectiles listed have been disarmed. Field Artillery Projectiles of the American Civil War, 1993 Edition. by Thomas S. Dickey and Peter C. George. Civil War Heavy Explosive Ordnance, A Guide to Large Artillery Prjectiles, Torpedoes, and Mines, by Jack Bell. 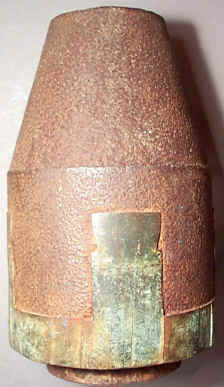 Artillery Fuses of the Civil War, by Charles H. Jones. Pictures are by the author, unless otherwise indicated. "Smoothbore ball", refers to a projectile used in a cannon without rifling. The balls are round. "Rifled projectile" refers to a projectile fired from a cannon with rifling. The projectiles are elongated. The rifling is long grooves cut the full length of the cannon, usually with a twist, the grooves are referred to as cuts, and the part not cut as "lands. "Sabot" refers to either a band or a block designed to seal the gases in the cannon tube on firing so that the projectile is expelled. For balls this is often a block of wood with a flat bottom. 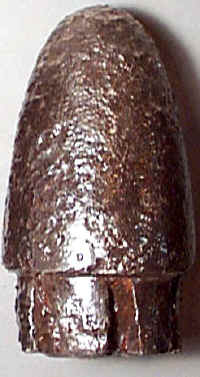 For rifled projectiles the sabot is some sort of band designed to be flexible to expand into the rifling. The count of the lands and grooves can often be seen in the sabot of the shell. "Solid shot" refers to a projectile that is solid cast, and contains no bursting cavity. A solid shot can be either round smoothbore or elongated rifled. "Common shell" means a projectile was cast with a bursting cavity containing only powder. In this respect the term "common" can be interperted as "standard", although design variations off standard of Civil War era Ordnance can be extensive. "Case shot" usually refers to the balls, lead or iron, packed in an artillery projectile. 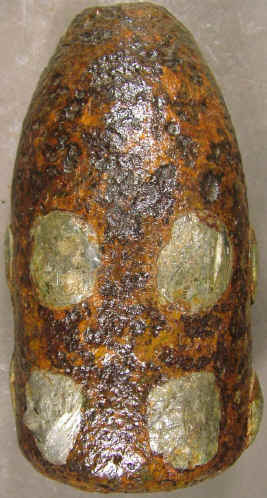 The projectile could be a round ball for smoothbore or a conical projectile for rilfed cannon, the projectiles were cast thick to withstand the stress of firing over distance, and were usually fitted with time fuzes designed to detonate the projectile over troops massed and exposed in open field formations. The balls were typically small, usually around .69in. or smaller and packed in a matrix to hold in place so that the powder charge would not be compacted and would maintain its explosive volatility. "Canister" usually refers to a can, made of thin sheet metal, fitted into cylindrical shape, and filled with "canister" balls, which could be lead or iron, the balls were packed in sawdust and the can usually did not contain any explosive charge. The canister was the artillerist's weapon of last resort. Once the enemy got close to the battery, the gunners would load these rounds, and the flimsy can would burst on firing sending the contents in scatter fashion against the troops charging the cannon. The canister could be used in either rifled or smoothbore cannon, and was intended to burst immediately on firing, consequently the presence or absence of rifling would not have been important. As a weapon of last resort, rounds could have been double or triple loaded without adversely stressing the cannon, because a standard powder charge could be used, and even though a heavy over load would be discharged, the distance of firing was very short. "Grape" or "stands of grape" refer to balls stacked loose, held in place with a bolt, rings and plates, or canvass, no explosive charge or sawdust, and no can. This also was the artillerist's weapon of last resort. Once the enemy got close to the battery, the gunners would load these rounds, and the flimsy stand would burst on firing sending the contents in scatter fashion against the troops charging the cannon. The stands of grape could be used in either rifled or smoothbore cannon, and was intended to burst immediately on firing, consequently the presence or absence of rifling would not have been important. As a weapon of last resort, rounds could have been double or triple loaded without adversely stressing the cannon, because a standard powder charge could be used, and even though a heavy over load would be discharged, the distance of firing was very short. Smoothbore artillery projectile, spherical ball, smoothbore 6 pounder, 3.67 in. Smoothbore artillery projectile, spherical ball, smoothbore 12 pounder, 4.62in. Smoothbore artillery projectile, spherical ball, smoothbore 18 pounder, 5.3in. Smoothbore artillery projectile, spherical ball, smoothbore 24 pounder, 5.82in. Smoothbore artillery projectile, spherical ball, smoothbore 32 pounder, 6.4in. Smoothbore artillery projectile, spherical ball, smoothbore 42 pounder, 7 in. 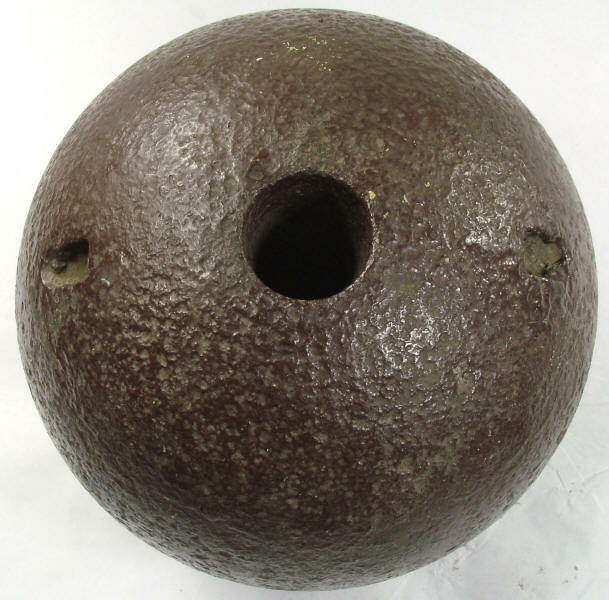 Smoothbore artillery projectile, spherical ball, 8 in. 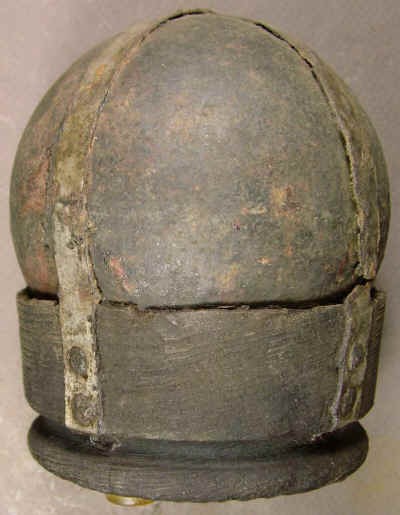 Smoothbore artillery projectile, spherical ball, 9 in. Smoothbore artillery projectile, spherical ball, 10 in. Smoothbore artillery projectile, spherical ball, 11 in. Smoothbore artillery projectile, spherical ball, 13in. Smoothbore artillery projectile, spherical ball, 15 in. Artillery projectile, stand of grape.